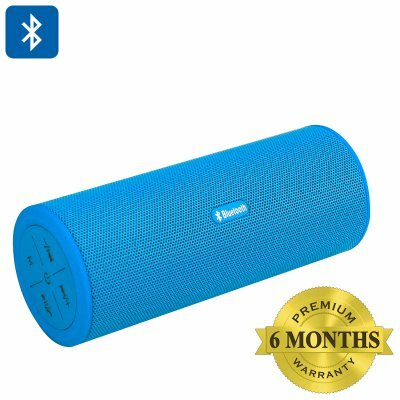 Successfully Added 10W Portable Wireless Speaker 'RockTube' - 360 Degree Sound, Bluetooth 2.0+EDR, 32GB Micro SD Slot, 2000mAh Battery (Blue) to your Shopping Cart. Enjoy the latest sound technology packed in this 10W portable Wireless speaker. This outdoor speaker beast comes with easy to use hook for attaching to your backpack for outdoor activities. Connect with other Bluetooth enabled devices or insert an Micro SD card (up to 32GB) for playing your favorite tunes. Comes with headphone slot for listening to music privately. Built in mic, awesome for making or receiving phone calls. Do you feel like enjoying better music? This RockTube wireless speaker is ready to rock your world. With double 5W output, it will play your favorite tunes in the best possible quality on earth. But there is more. The RockTube is more than just a portable speaker. Two cool features that are worth mentioning is the built in mic and Micro SD card slot. The first allows you to make handfree phone calls, while the latter enables you to insert an 32GB card slot that could carry over 7000 songs! Whether you play your songs through the speakers to share with a crowd, or enjoy privately by inserting your headphones, the RockTube always delivers your tunes at its best. With all the greatness described above you might expect a pretty expensive price tag. That's not the case, as the RockTube is sourced direct from a top quality Chinese factory that also produces for big brands like Beats by Dr. Dre. The only difference is that you're skipping the markups earned by middle men and brand owners. Order now and enjoy wholesale pricing today!.